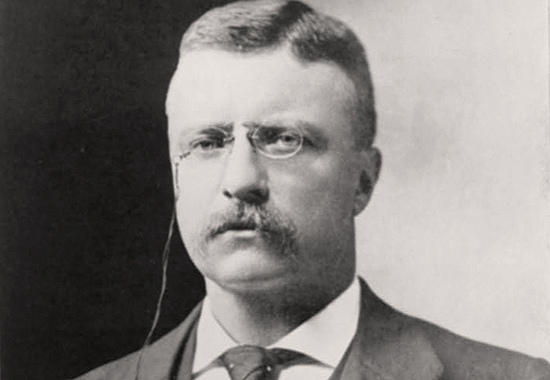 From 1901-1909, Teddy Roosevelt was the 26th president of the United States. 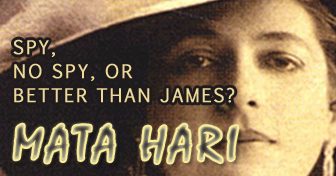 He was also a rancher, a historian, and an author. Furthermore, Roosevelt was the nation's hero of the Spanish-American War of 1898. Teddy Roosevelt was the reason why we call the White House the White House and, on a slightly more important note, why we call the Teddy Bear the Teddy Bear. Theodore Roosevelt was an outdoor man. Protecting the natural environment, therefore, was one of his priorities. 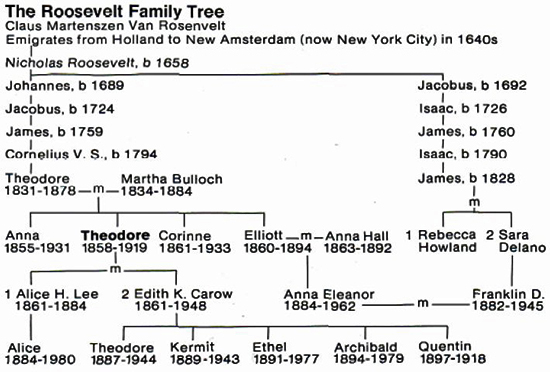 Here is a family tree via which you can trace how Theodore, Franklin Delano, and Eleanor Roosevelt were related. in Dutch, Roosevelt means Field of Roses. Thus, the family's coat of arms represents a rose bush in a green field. 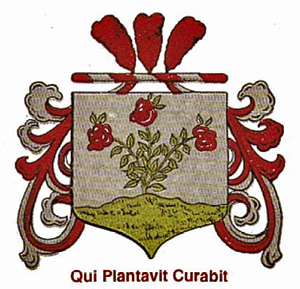 The motto, Qui Plantavit Curabit, translates He Who Has Planted Will Preserve. On January 26, 1883, in Buffalo, NY, Theodore Roosevelt gave his speech The Duties of American Citizenship. On April 10, 1899, Theodore Roosevelt delivered his The Strenuous Life speech at the Hamilton Club in Chicago. On September 6, 1901, the 25th President of the United States, William McKinley, was shot. McKinley died on September 14, 1901. 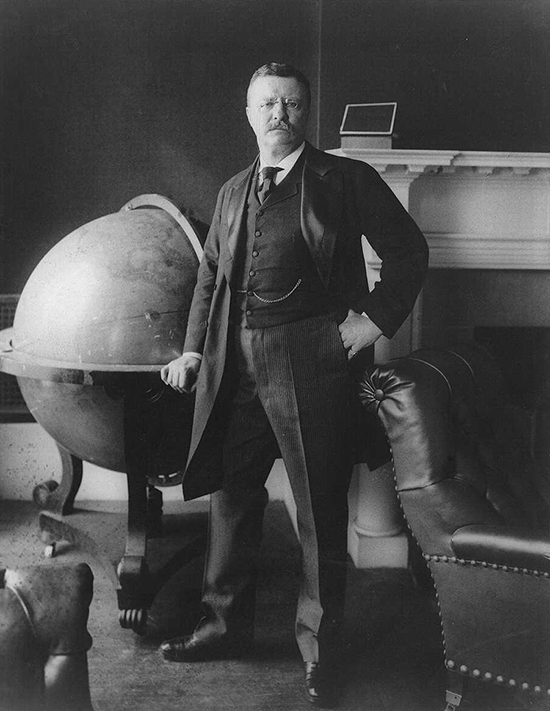 Later on the same day, McKinley's Vice President, Theodore Roosevelt, was sworn in. At forty-two, Roosevelt became the youngest president in the nation's history. What about Teddy Roosevelt's First Inaugural Address? The Inauguration took place in the library of the Ansley Wilcox residence in Buffalo, New York. The residence was located at 641 Delaware Avenue. It was the home of Ansley and Mary Grace Wilcox, Roosevelt's friends. There was no Bible used and there was no public speech. All photographers were kicked out of the room after one genius knocked over another one's camera equipment. Roosevelt ended McKinley's term without having a vice president himself. On December 3, 1901, and as his First Annual Message to the Senate and House of Representatives, Theodore Roosevelt delivered his Controlling the Trusts speech. On August 16, 1903, Roosevelt delivered his Strength and Decency speech. In 1904, Theodore Roosevelt started the building of the Panama Canal. The Republican Club of the City of New York invited Roosevelt to speak at their 19th annual Lincoln Dinner at the Waldorf-Astoria. 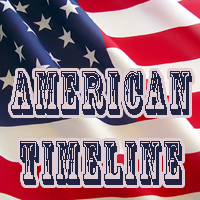 Celebrated was the 96th anniversary of the birthday of Abraham Lincoln. Theodore Roosevelt accepted the invitation, and on February 13, 1905, Roosevelt delivered his Lincoln Dinner Address. Some also call it the Lincoln and the Race Problem speech. On March 4, 1905, Theodore Roosevelt delivered his Inaugural Address. 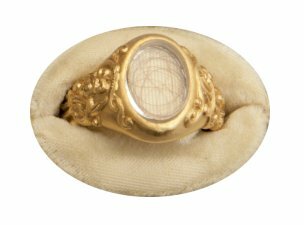 The National Park Service informs us that Teddy Roosevelt wore this ring, containing pieces of Abraham Lincoln's hair, during his second inauguration. At the laying of the cornerstone of the Office Building of the House of Representatives in Washington D.C. on April 14, 1906, Theodore Roosevelt delivered his The Man With the Muck-Rake speech, in which he refers to the Pilgrim's Progress, a 17th century best-seller written by the English author John Bunyan. In 1906, the Nobel Peace Prize was his. Roosevelt received this award for his role in bringing about various peace treaties that ended the Russo-Japanese War. On January 22, 1909, Theodore Roosevelt sent a special message to the Senate and House of Representatives, also called the The Conservation of Public Lands message. In this message, Roosevelt emphasized the importance of the protection of natural resources by the government. On April 23, 1910, Theodore Roosevelt visited the Sorbonne at Paris, France, and delivered his The Man in the Arena speech. The fine people of Osawatomie, Kansas, were ready for their John Brown Celebration and invited Theodore Roosevelt to speak on the occasion. Roosevelt accepted and on August 31, 1910, he delivered his The New Nationalism speech before approx. 30,000 pairs of ears. 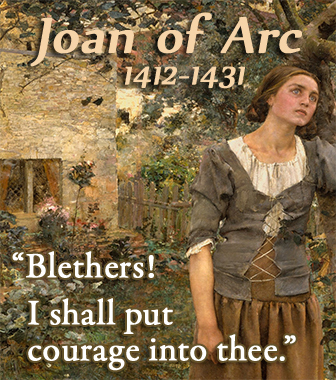 Go here for more about John Brown. John Schrank followed Roosevelt for 2,000 miles through eight states in 24 days of campaigning, waiting for an opportunity to kill him. Roosevelt walked out of his hotel, got into his open car, and turned to wave at the crowd. Schrank fired his .38 Colt revolver from six feet away. Roosevelt was struck in the right chest, suffering only a broken fourth rib and a minor wound. A metal case for carrying reading glasses and a folded 50-page speech slowed the bullet substantially, such that Roosevelt was able to complete his speech. He told the audience, "It takes more than one bullet to stop a bull moose!" After the speech, he was taken to the hospital for treatment. 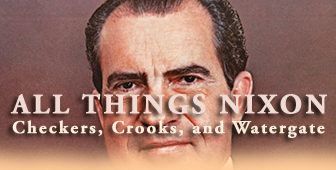 He carried the bullet in his chest until he died seven years later, of natural causes. Schrank was tried and spent the rest of his life in prison.